1. the inmost part of a structure or organ. 3. marrow. adj., adj med´ullary. 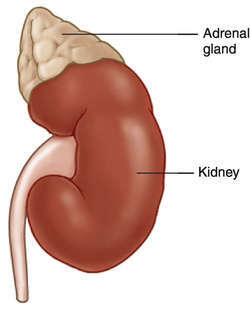 adrenal medulla the inner portion of the adrenal gland, where epinephrine and norepinephrine are produced. medulla of bone bone marrow. medulla oblonga´ta that part of the hindbrain continuous with the pons above and the spinal cord below; it houses nerve centers for both motor and sensory nerves, where such functions as breathing and the beating of the heart are controlled. See also brain. renal medulla the inner part of the substance of the kidney, composed chiefly of collecting tubules, and organized into a group of structures called the renal pyramids. medulla spina´lis (medulla spina´lis) spinal cord. medulla of thymus the central portion of each lobule of the thymus; it contains many more reticular cells and far fewer lymphocytes than does the surrounding cortex. the most caudal subdivision of the brainstem, immediately continuous with the spinal cord, extending from the lower border of the decussation of the pyramid to the pons; its anterior (ventral) surface resembles that of the spinal cord except for the bilateral prominence of the inferior olive; the posterior (dorsal) surface of its upper half forms part of the floor of the fourth ventricle. Motor nuclei of the medulla oblongata include the hypoglossal nucleus, the dorsal motor nucleus, inferior salivatory nucleus, and the nucleus ambiguus; sensory nuclei include the nuclei of the posterior column (gracile and cuneate), the cochlear and vestibular nuclei, the middle and caudal portions of the spinal trigeminal nucleus, and the nucleus of the solitary tract. The lowermost portion of the vertebrate brain, continuous with the spinal cord, responsible for the control of respiration, circulation, and certain other bodily functions. a bulbous continuation of the spinal cord just above the foramen magnum and separated from the pons by a horizontal groove. It is one of three parts of the brainstem and mainly contains white substance with some mixture of gray substance. The medulla contains the cardiac, vasomotor, and respiratory centers of the brain. Medullary injury or disease often proves fatal. Compare mesencephalon, pons. Also called, (informal) medulla. The lower half of the brain stem, which is located between the spinal cord and the pons. • Cardiac centre—Sympathetic, parasympathetic systems. • Reflex centres—For vomiting, coughing, sneezing, swallowing. Autonomic and involuntary functions, including breathing, maintaining the heart rate and blood pressure. The most caudal subdivision of the brainstem, continuous with the spinal cord, extending from the lower border of the decussation of the pyramid to the pons; its ventral surface resembles that of the spinal cord except for the bilateral prominence of the inferior olive; the dorsal surface of its upper half forms part of the floor of the fourth ventricle. Motor nucleiof the medulla oblongata include the hypoglossal nucleus, the dorsal motor nucleus, inferior salivatory nucleus, and the nucleus ambiguus; sensory nuclei include the nuclei of the posterior column (gracile and cuneate), the cochlear and vestibular nuclei, the mid and caudal portions of the spinal trigeminal nucleus, and the nucleus of the solitary tract. 2. In anatomy, the innermost or central portion of an organ in contrast to the cortex. The central axis of a hair. The central portion of the ovary, composed of loose connective tissue, blood vessels, lymphatics, and nerves. The part of the BRAINSTEM lying below the PONS and immediately above the spinal cord, just in front of the CEREBELLUM. The medulla oblongata contains the nuclei of the lower four CRANIAL NERVES, the vital centres for respiration and control of heart-beat, and the long motor and sensory tracts running down to and up from the spinal cord. Disease or injury to the medulla is always serious, often fatal. the posterior part of the hindbrain of vertebrates that connects with the spinal cord. It is ventrally thick-walled and contains groupings of nerve cells called nuclei. The thin-walled posterior CHOROID PLEXUS is situated on its dorsal side. The medulla contains several important areas of nervous control not influenced by conscious action. The respiratory and cardiovascular centres control respiration and heartbeat and organs of the LATERAL-LINE SYSTEM. The ear, taste and touch receptors also have their impulses coordinated in the medulla. The lowest section of the brainstem, located next to the spinal cord. The medulla is the site of important cardiac and respiratory regulatory centers. The most caudal subdivision of the brainstem, continuous with the spinal cord, extending from the lower border of the decussation of the pyramid to the pons. n the direct upward extension of the spinal cord that lies at the junction between the cerebrum and the spinal cord and is considered to be in a group with the pons and midbrain because the nuclei of all the cranial nerves except one are situated within this structural group. Its functions are associated with the nuclei of the glossopharyngeal, vagal, spinal accessory, and hypoglossal nerves. It controls the reflex actions of the pharynx, larynx, and tongue, which are related to deglutition, mastication, and speech, as well as the visceral reflexes of coughing, sneezing, sucking, vomiting, and salivating, and other secretory functions. pl. medullae [L.] the central or inner portion of an organ. the inner portion of the adrenal gland, where epinephrine is produced. bone marrow, contained in the medullary canal of bone. that part of the hindbrain continuous with the pons anteriorly and the spinal cord posteriorly; it houses nerve centers for both motor and sensory nerves, where such functions as breathing and the beating of the heart are controlled. Called also myelencephalon. In animals the principal clinical manifestations of local lesions in the medulla are those of head rotation and circling, and facial and tongue paralysis with resulting difficulty in prehension and swallowing. With diffuse lesions spastic paralysis or a stiff-legged incoordination occurs. the inner part of the substance of the kidney, composed chiefly of collecting tubules, and in some species organized into a group of structures called the renal pyramids. the central portion of each lobule of the thymus; it contains many more reticular cells and far fewer lymphocytes than does the surrounding cortex. Ajarem, "Acrylamide disrupts the development of Medulla oblongata in Albino rat: biochemical and morphological studies," African Journal of Pharmacy and Pharmacology, vol. Because this is such a broad area of research, this paper will focus particularly on the medulla oblongata region of the brain. At the root of the medulla oblongata, these changes occupied the whole breadth of both the medullary fasciculi to the extent of half an inch in breadth from above downwards. Regulation of breathing primarily falls on the central centers, the central chemoreceptors on the ventral surface of the medulla oblongata. The T-box area on the head is where the medulla oblongata is and acts like a light switch when shot. Using a macrophotography apparatus, selected sections, primarily from the lugol fast blue-cresyl echt violet series, beginning with the olfactory bulb and ending with the medulla oblongata, were photographed with gaps of about 300-560 [micro]m between sections. On the reflex function of the medulla oblongata and medulla spinalis. You just have to trust the animal part of your brain, the medulla oblongata. And who wants to have his medulla oblongata restructured by a physician who admits that he is only performing brain surgery "to keep myself busy"? These involve several nuclei: the para-brachial and Kolliker-Fuse, solitary, dorsal vagus, paratrigeminal (PA5), trigeminal subnucleus caudalis (SC5), raphe magnus, area postrema and medial and lateral reticular nuclei in the medulla oblongata and pons (rostro-ventro-lateral and lateral). Vertebral arterler; medulla oblongata, beyin sapi, serebellum, temporal loblarin bazal kismi ve oksipital loblari beslediginden, vertebral arter anjiyografisi bu tip norolojik komplikasyonlar acisindan yuksek risk tarir. Oi still know me central cortexes from me medulla oblongata and the cerebellum. InsideView: If it's good enough for Professor Chinn..